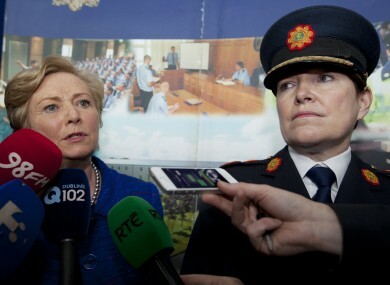 Frances Fitzgerald with acting Garda Commissioner Noirin O'Sullivan (File photo). JUSTICE MINISTER FRANCES Fitzgerald has said it is “regrettable” that no TD other than herself attended the public consultation process held ahead of the drafting of the Garda reform Bill. Fitzgerald presented the much-anticipated Garda Síochána Bill 2014 to the Dáil today. She said that the “primary objective” of the new legislation is to strengthen the role and remit of the Garda Ombudsman Commission (GSOC). The consultation forum was held in Farmleigh earlier this year and was attended by some 100 participants, representing key stakeholders and direct contacts with GSOC. Fitzgerald said it was “regrettable that no member of the house, other than myself, attended the event in Farmleigh”. However, she thanked the Opposition for sending staff members to act as their representatives. Members of the Oireachtas Justice Committee also visited jurisdictions abroad for research purposes. Providing greater autonomy for GSOC in examining the Garda Síochána’s practices, policies and procedures. On the subject of whistleblowers, Fitzgerald said there had been “serious failures on penalty points” within the force, however she added that the vast majority of gardaí make “an ongoing and substantial contribution” to the safety of the general public. In some cases, what we have learned about the behaviour of members of An Garda Síochána has struck at the heart of our shared understanding of what justice itself is. We live in a republic, a republic of laws, where there is not and never can be a situation of one law for some but not others. This will involve confronting deficiencies and failures, and it will involve examining openly and transparently and vigorously, where there are operational practices that are simply not up to standard. This will be done. The minister said that further changes in relation to GSOC will be considered in relation to establishing a new Policing Authority “which I will introduce as quickly as possible”. It is expected to be up and running by the end of the year. Last month, Fitzgerald’s predecessor Alan Shatter called on GSOC Chairman Simon O’Brien and his fellow Commissioners to step down, insisting their positions were untenable in the wake of allegations their headquarters were bugged. A report into how these claims were leaked to the Sunday Times proved inconclusive. Futzgerald noted that last week’s Budget provided for 400 new vehicles, 300 gardaí entering Garda College in Templemore, and the civilianisation of immigration functions to free up 150 Gardaí to frontline policing. It also included an increase of €1 million in the allocation to GSOC and an increase of €250,000 in the allocation to the Inspectorate. Sinn Féin’s Justice Spokesperson Padraig Mac Lochlainn welcomed the measures included in the Bill, but said that more needs to be done to restore public confidence in the force after “a very disturbing period”. “We will seek to amend the Bill to ensure that GSOC will have access, on a statutory basis, to the PULSE system to assist in their investigations. “Our amendment will also include the recommendation of a single Ombudsman as opposed to the three commissioners as laid out in the Bill. This would ensure a greater degree of accountability and that there is no possibility of dissenting opinions or divergence in the Ombudsman’s findings,” Mac Lochlainn said. Email “Frances Fitzgerald: It's 'regrettable' that no TDs showed up to discuss Garda reform Bill”. Feedback on “Frances Fitzgerald: It's 'regrettable' that no TDs showed up to discuss Garda reform Bill”.